Carl Frampton will fight Josh Warrington after beating Luke Jackson. 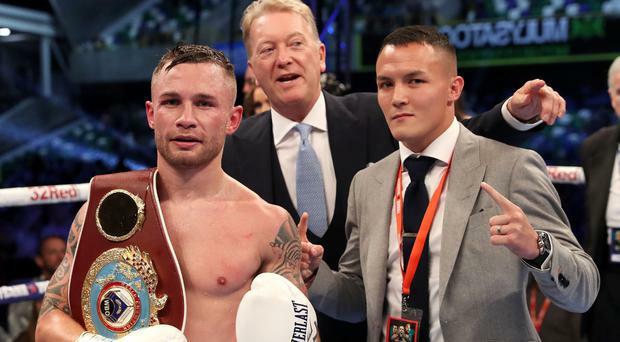 Carl Frampton is set for a mouth-watering clash with IBF World featherweight champion Josh Warrington later this year after beating Luke Jackson at Windsor Park. Both fighters are working under promoter Frank Warren, who revealed that the bout will go ahead later this year. "Carl wanted to come to Windsor Park - that was his dream. We delivered, he delivered," Warren said, speaking from the ring at Windsor Park. "We're now going to make the dream fight. These two guys in the ring is a dream fight for the fans and we're going to make it happen. I know they want it and I know you fans want it. It will happen - definitely this year. It's on." It is understood the bout will happen at the end of November or early December and is likely to take place at the Manchester Arena. Having beaten Lee Selby to win the title in May, Warrington is clearly a man on a mission to show he is the best in the UK and came into the ring after Frampton saw off Jackson. "I'm looking to get the fight," he said. "For me, I beat Selby, I'm still ranked behind Carl. I'd like to be number one for Christmas. "I've got a lot of respect for this man. This is boxing. You want to fight the best." Frampton had been linked with a fight against WBO champion Oscar Valdez as he holds the interim title and as such is the mandatory challenger to the Mexican. However, Warrington will be his next opponent. Frampton said: "Josh is top of the list. That fight's the easiest one to make. He's keen and I'm keen as mustard, so let's do it. "We have a World Champion in the ring in Josh Warrington. Hopefully a fight can be done. I'm not a World champion - I'm not saying I'm a World champion because I have this interim title. Josh is a World champion and I would love to be a World champion again." Jarrell Miller says he has “never knowingly taken any banned substance” and intends to appeal against the decision to revoke his licence following an adverse doping test.